C. Neighbor route-map SoO in with the same SoO value. D. Neighbor route-map SoO in with a different SoO value. E. Neighbor route-map SoOout with the same SoO value. RSPAN source monitoring is properly set, which action fixes this problem? A service provider engineering team must design a solution that supports end-to-end LSPS for multiple IGP domains within different AS numbers. According to RFC 3107, which solution achieves this goal? A service provider is implementing an nV Edge system with the two ASR 9000 chassis has two RSPs. Which two cabling methods reflect the minimum configuration needed for full synchronization between the two Cisco ASR 9000 chassis? offers the optimal performance and provides the minimum number of actions that match the service provider QoS requirements? service components interoperate; and understand the functional requirements and translate into specific device configurations. Caught up with Ali (a school friend of mine today) and her children. It was great to see them but also realised just how much I miss them. They live a couple of hours away and we don’t get to see them that often – last time was about a year ago. Having kids at school, and both of us with husbands and kids that playwindowskeys.net sport in the weekend means we can really only meet during the school holidays now. We both drove for an hour to meet in the middle, the kids had a run around in the park for an hour and a half, then we had lunch and more play at McDonalds. The kids all played well together although Elliot still thinks he’s the Kung Fu Panda and had to remind him not to hit the others! 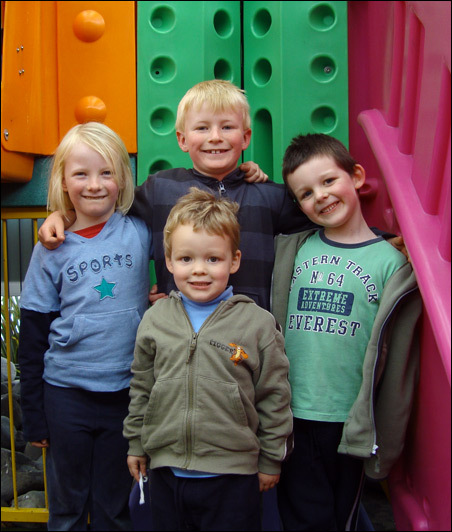 Here’s a photobuy windows 10 key of Jack (7), Abbey (6), Max (5) and Elliot (3). Just another quick one – there is a BIG update coming soon!! It is Marc’s birthday today. Hardly saw him as he had to work, but we’ve just come home from having a very nicewindows 10 product key meal at Taste in Khandallah this evening – just the two of us which was lovely. 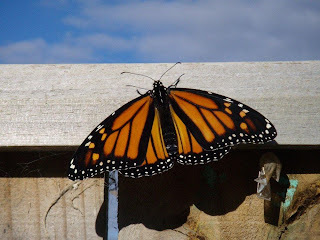 Do you remember Softy – our monarch butterfly caterpillar? 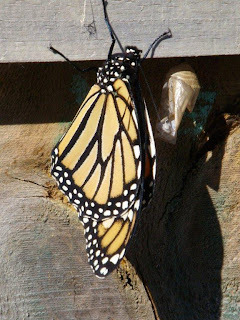 We came home from Max’s first day at kindy to find Softy out of the cocoon and drying his wings. 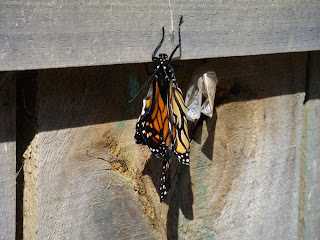 We watched him over the next few hours until he climbed up on top of the fence, flapped his wings a few times and off he flew. We still have Silky and Smoothy in theirWindows 10 Professional OEM Key cocoons, but they should be hatching in the next week or so. The boys spent a day out and about with Grannie Annie. She took them to the beach at Petone, the park and for a picnic. 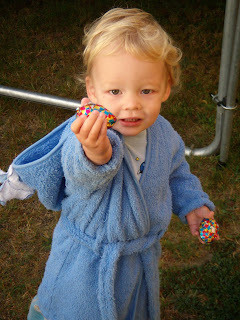 Max was most excited that he had had two picnics – one at the beach and then another when they got back to Grannie’s house. They also spent a day out with Grandad and Ngaire, but as it was a public holiday they didn’t get to go on the steam train at the train museum (unfortunately it was closed). Marc and I took James (one of Marc’s ex-colleagues – visiting from Sydney) out for lunch and then on a tour of Wellington. He came back to our house for dinner, and had a great time playing with the boys. 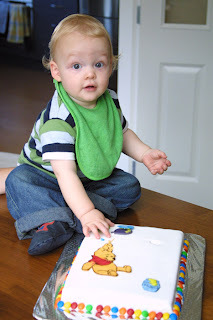 The following weekend was Elliot’s 2nd birthday. We didn’t have a party for him this year but we did go out for brunch and had fish and chips for tea. Thank you to everyone for the lovely presents, and especially those of you overseas who sent him clothes – he got so many that he won’t need to wear too many of Max’s hand-me-downs! Marc has been away travelling a lot – he had that week in Sydney, has just returned from eight nights away in Las Vegas, is in Auckland today and tomorrow, home all next week, then back to Auckland for two days (looks like that will be happening once a fortnight), then he heads back to Sydney for another four days the following week. As for me – I’ve been busy taking the boys to kindy, playgroup, music, supermarket shopping, cooking, cleaning, laundry, kindy and playgroup committees and all those other things mums get to do! Have also spent evenings getting my business up and running. I’ve been sorting and displaying samples, packaging up stock, and now just have to get people to see the products! I seem to be off to a good start – sold 23 cards in two days last week, and have four ‘coffee and card’ events booked in so far for May/June. The products pretty much seem to sell themselves as they are fantastic quality at less than shop prices. Will just have to see how it goes. 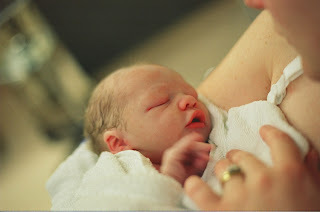 I can’t believe my little baby boy is two today. Two years ago today when he was in such a rush to get here – I was cleaning like a crazy woman all morning, lay down for a restwindows 10 key Online in the afternoon and he kicked so much I couldn’t sleep, my contractions (which I thought were just baby kicks/stretches) weren’t bothering me but Marc was timing them nonetheless, then made me get into the car, took me to hospital and 36 minutesbuy windows 10 key after leaving home and two pushes later Elliot arrived into the world! Marc’s football team had a pre-season game on Sunday 25 March which they won, and Marc’s legs seem to be OK (he was out for most of last season with Achilles problems). He’s played again a couple of times since then, and all’s going well. I did a turn at parent help at Max’s kindy before end of term. It was nice to see what Max gets up to there and how much he’s changed since he first started going. The younger kids now follow him around including three or four girls who always want to play with him. He’s off to morning kindy at the beginning of next term (five mornings a week) so he’ll be the youngest for a little while. It will be interesting to see which of the big kids he follows around! We’ve also spent a lot of time with Ian and Ngahuia – who live down the road (both colleagues of Marc when he worked at Dell – and he now works with Ngahuia at NetApp). Ian’s daughter Megan has been in New Zealand (visiting from the UK) so we took Ian and Megan along with us to playgroup, music, swimming, Junglerama, and the local park. 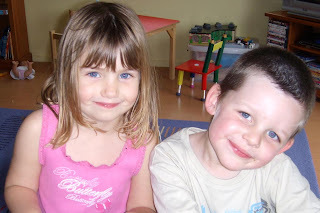 Max and Megan are a couple of weeks apart in age and got on really well…. We also spent a lovely relaxing weekend with them at their holiday home over the hill in the Wairarapa. The weather was great and the kids (and I&N’s dogs) spent most of the weekend running outside. 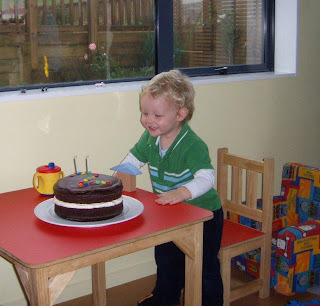 The following week was end of term for playgroup, music and kindy – with Max having a party at kindy on the last day – not because he is moving up to morning kindy – but because Linda (his favourite teacher) was leaving to move to another kindergarten. 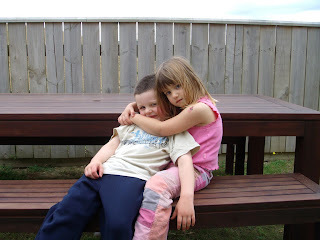 She has been fantastic with him and he (and the other children too) will really miss her. My mum also had her birthday during that week, so the boys and I had lunch with her, and that night Marc and I, my sister Ali and her partner Clay took mum out for dinner to a fantastic Cambodian restaurant in town where we had a lovely meal – we’ll be going back again I’m sure. Easter was nice but busy. I attempted to make Hot Cross Buns on Good Friday. I used the recipe in my breadmaker book and they turned out to be absolutely revolting – next year I’ll do it the real way and knead everything by hand. 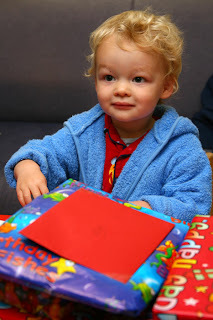 Saturday the boys had a birthday party to go to for Max’s friend James who was turning 4. His party was great and the kids enjoyed a treasure hunt, pass the parcel and playing musical statues (which was entertaining as it’s pretty hard for 4 year olds to stand still!) After the party we went to Ian and Ngahuia’s for a BBQ – the weather was pretty mild so we sat outside to eat dinner (possibly the last time for a little while though). 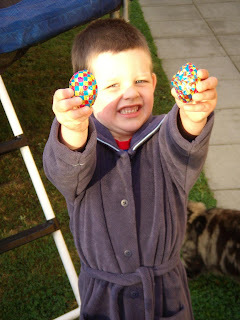 Sunday the boys were excited to find the Easter bunny had left them an Easter egg each, and they also enjoyed running around outside finding the ones hidden there. They were also given Easter treats by Ali and Clay, Nana Jan, Grannie Annie, Clay’s little niece Emma (she’s not even one yet!) and some money from Grandad Len and Ngaire – thank you to all of you. The rest of the weekend is a blur as it went past so quickly, but I know we enjoyed a really nice BBQ dinner at Grannie Annie’s, we collected and put together bunk beds for Max, moved the boys bedrooms around, farwelled Megan, Marc played football, and I managed to do a little bit of gardening too! 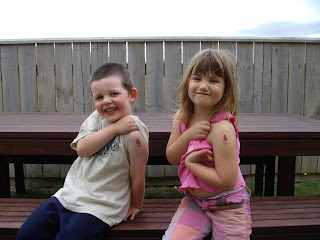 We then had two weeks of school holidays to fill – so have had lunch on various days with Marc, Grannie and Nana, morning tea with Auntie Ali, various playdates with Max’s kindy friends, a visit to the library, a birthday party for my friend Nickie’s son Ryan who turned 2, and Max and I did lots of weeding and hacking of bushes on fine afternoons while Elliot slept. Marc is currently away (for the second week of the holidays) on a training course in Sydney so it’s been pretty hard going entertaining both of them all day, everyday! Thankfully he gets back tonight. I’m also busy setting up a little business so that should kick off in the next couple of weeks – I’ll tell you more about that soon. Not making any promises but I am going to try to update more often (more than once a month anyway) in the future!